They’re going to be watching you! And how you paint your face will impact how your character is perceived and understood by the audience. Have fun doing the make-up. Be as creative as you want to. There really aren’t any rules to go by, but there are certain tricks that will make your character more interesting and believable. 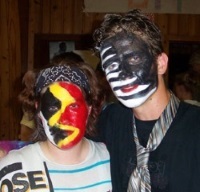 Face painting is important, so work at it and do it well, because they’ll be watching your every move and expression. Makeup: How your character looks is extremely important to a successful mime service. Practice painting faces before a dress rehearsal, so you can work out any bugs and know how much time you actually need to prepare for the final show. This also give you a more casual atmosphere to try different painting techniques and various designs. You won’t want to be doing this for the first time right before the big show. Supplies: You will need to buy some supplies to apply and remove the clown make-up. Here’s a list: Clown make-up (lots of white, smaller amounts of other colors), Q-tips, baby powder, cold cream, paper towels. 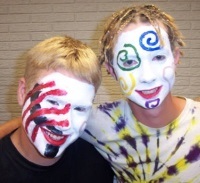 Clown make-up is available at theater supply stores in most larger cities. If you can’t find one, go to our Clown Ministry page for theater supply stores that do mail orders. Face Painting: First wash the face with cold water and soap. Apply a light layer of cold cream on the face, then apply the white base paint to the face. With Q-tips remove the white paint and expose the skin where the designs will be painted on with colors. Then use Q-tips to apply the colored paint. When finished have someone “dust” the face with baby powder or with a sock containing flour. Beat the sock filled with flour to let the particles be sprinkled over the face. Or put some powder on a piece of paper and blow gently onto the face. Don’t touch the face during this process. The dusting will give the face a dry realistic appearance. Makeup Removal: Removal of makeup is messy but simple. Apply cold cream to the face, then wipe it off with a towel. Repeat until most of the paint has been removed, then wash the face with warm water and soap. If you don’t want to ruin a cloth towel use paper towels. 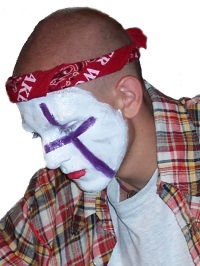 Mime Ministry: For more info about our three mime dramas. Shine! Photos and ideas from the SHINE! mime drama.